Are your gutters leaking or clogged? Bent or broken? Causing more problems than they’re fixing? If so, AWT Vinyl can help. Damaged gutters are a common source of mold and roof leaks, not to mention they can be unsightly, which makes purchasing new gutters extremely important for your health and the overall value of your home. But not all gutters are created equal. At AWT Vinyl, we’ve seen the effects of shoddy craftsmanship and are proud to only offer aluminum, seamless products that are durable and efficient. This affordable upgrade can have an immediate effect on any house by adding to the exterior beauty of your home, keeping the lawn and roof clean, and relocating moisture and condensation. And with optional upgrades like Leaf Relief, maintenance is made all the easier. As Middle Georgia’s leading expert on home remodeling, AWT Vinyl has the staff and experience to handle all of your gutter guard needs quickly and affordably. We take customer service very seriously and promise to offer a respectful and no-hassle sales experience. We’ll also walk you through the whole process before the project begins so you know exactly what to expect. And, we're fully licensed, bonded, and insured and all of our work comes with an unbeatable lifetime labor guarantee. 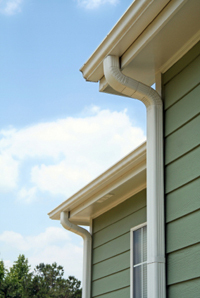 To learn more about the gutters available from AWT Vinyl or to request an estimate, contact our sales team today.